Real estate listing agents are at it again. They are holding back the "whole truth" when dealing with prospective home sellers, and sellers no longer so easy to trick. It seems that I have spoken with more people who want to sell a home in the past 60 days than I have in any previous 2 month period of time, and many are upset with how they are being misled by the real estate listing agents who come to their home to win their business. From what I am hearing, it sounds to me like the "pitch" from real estate listing agents has not changed much, even though our industry has been re-invented by technology, and gutted by housing market cycle extremes. Today, I want to explore the 3 most often regurgitated statements that many real estate listing agents say to people who need to sell a home, and why they just aren't true any more. It's All About Exposure - Typically, real estate listing agents are going to show you that when you list with them, your home will be listed for sale on a zillion real estate websites. After all, it's all about exposure.... or is it? 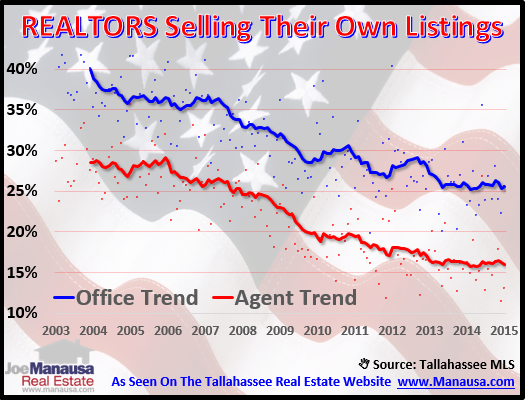 If you list your home for sale with any REALTOR® in Tallahassee, your home will be placed in the Tallahassee Board of REALTORS Multiple Listing Service. This service provides an IDX feed that will put your listing on hundreds of different websites. So whether you list your home with the biggest, the smallest, a brand, a local, full service, or discount, your home will be exposed "all over the internet." 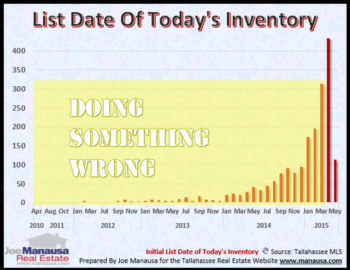 If it is "all about exposure," then why did more than 1/2 of all homes listed for sale in the Tallahassee MLS last year fail to sell? They were all exposed on hundreds of different websites by their real estate listing agents. The sellers did EXACTLY what their real estate listing agents said to do. The simple answer is because it takes more than just raw exposure to sell your home, that's why. Lie #1 debunked! If It Doesn't Sell, It Has To Be You're Priced Too High - The first lie is always followed by this historical favorite ... when the real estate listing agent says ... "if nobody has bought it, your home must be overpriced!" While a home priced too high is most likely not going to sell, this does not mean that the asking price is the reason that it is not selling. The fact is, today's technology allows for well-trained real estate listing agents to know where the "ready buyers" for your home are located on the internet. If the house has not be presented to these ready buyers, then it is not likely that price has even become an issue. Selling a home is not about price, nor simply about exposure, rather it is a combination that we refer to as targeted exposure. Simply giving a home away (by continually lowering the price) is a poor method to use when trying to overcome a lack of marketing knowledge and experience by the real estate listing agent. Lie #2 debunked! The Average Market Time Is A Factor In Selling Your Home - Perhaps one of my favorites (it's the math geek in me), the "market time for selling a home" lie has been around for a long, long time. In fact, it makes sense why people try to track this, it's just not that well thought out by the real estate listing agents who do. First of all, if there is liquidity in an area and price range, then market time is the amount of time it takes to get the message out to "ready buyers" for the home. In days of old, this might be more than a month, because real estate listing agents had to ensure that the home was seen in all magazines and newspapers in order to reach the majority of buyers. But times have changed. Ready buyers have already subscribed to a listing feed and are notified daily of all new listings and similar homes with price reductions. This means that for "ready buyers," they will be notified within 1 to 4 days of a new listing hitting the MLS (or a price being reduced in the MLS). So what is market time then? Smart home sellers know that today's internet-using homebuyer will know about their home in 1 to 4 days, and this seller knows how many ready buyers will purchase a similar home each month. If the real estate listing agent targets the home to "ready buyers," then market time for most homes is any about 4 to 14 days. For homes with few buyers (think low liquidity at higher price points), market time can be measured by examining supply and demand. But here's how you do not measure market time. After failing to sell a home as a "For sale by Owner," Mary and Bob list their house for six months with real estate listing agents Ken and Barbie. This agent "team" does a poor job with targeting the home and it fails to sell. Mary and Bob do a better job on their third try and hire Broker Joe :). The home sells in 17 days. What will the MLS say is the market time? 17 days in most MLS systems. Why, because they are not configured to measure "non MLS" marketing time or prior periods of time to sell. Mary and Bob list their home for $10M with real estate listing agents at a local brokerage, even though it's worth $150K. After 3 months, they lower their price to $1M, and then 2 months later lower it to $200K. Finally, one month later they lower it to $145K and it sells in 1 week, so what was the market time? The MLS will record 6 months, but the reality is that it sold within a week of being priced correctly. Mary and Bob list their home for sale with real estate listing agents Larry and Terry. It never sells. What is this market time? How does it go into the measurement for market time for all homes? So, the real deal with market time is that our MLS systems are not designed to extrapolate the real time the home was targeted correctly to the right group of buyers at a price point that would draw an offer. So a smarter way to go about planning your move is to do a supply and demand analysis and use housing market liquidity to determine the likelihood of an immediate sale. Lie #3 debunked! I hope this helps you next time you plan to talk to real estate listing agents about the job of selling your home. If he or she falls into discussion of one of these points, you are now better prepared to call them on it! If you are wondering whether or not you should sell your home now, just drop me a note and we will discuss your options. Do Realtors All Use The Same Home Valuation Process? It is always about price. At the end of the day, if your home doesn't sell, it's because the price is too high. There are a lot of things you can do INSTEAD of lowering the price to sell the house, but lowering the price WILL ALWAYS WORK if the bottom dollar gets low enough. ALWAYS.